No speed cameras will operate in the South West next year, unless the government comes forward with more funding, police have warned. Devon and Cornwall Safety Camera Partnership is being wound up with the loss of about 40 jobs. The force is currently in talks with the Department for Transport (DfT), but a police superintendent said the future was "looking bleak". A DfT spokesman told BBC News these were "difficult financial times". No decisions have yet been made on funding, he said, nor would they be until the comprehensive spending review which is due in the autumn. Supt Tim Swarbrick said: "It's very, very uncertain and very worrying. "Safety cameras have been used for a number of years very successfully and they've brought down road casualties and reduced deaths on the road, but the future is looking bleak." The national road safety charity RoadPeace has also said it was a worrying situation. Jeff Baker, whose son was killed in a crash, said: "I think it's devastating - it's going to cost lives." 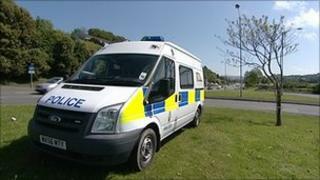 Devon and Cornwall Police said traffic officers would still ensure there was still some speed enforcement in the region.